Marianne Bitler is a Professor in the Department of Economics at the University of California, Davis; a Research Associate at the National Bureau of Economic Research; and a Research Fellow at IZA. She received her PhD from the Massachusetts Institute of Technology in 1998. Her research focuses on the effects of the US social safety net on poverty, income, human capital, and health; economics of the family; economics of education; and health economics. She is currently serving on a National Academies/Institute of Medicine/Food and Nutrition Board panel that is reviewing the new food packages for the Special Supplemental Nutrition Program for Women, Infants, and Children (WIC) and on a National Academies/CNSTAT panel that is evaluating the revised Survey of Income and Program Participation. 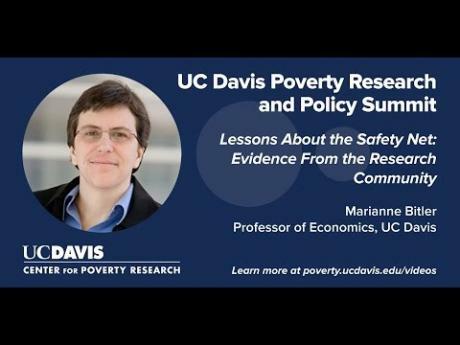 This presentation by UC Davis economist Marianne Bitler describes the US social safety net and the great strides made in understanding our reformulated safety net in the last decade, driven by a variety of advances in availability of new data, new sources of variation, and creative research designs. A UC Davis economist and Center for Poverty Research Faculty Affiliate is taking part in an evaluation of the Special Supplemental Nutrition Program for Women, Infants, and Children (WIC). The project is being conducted by a committee organized by the National Academies of Sciences, Engineering, and Medicine at the request of the U.S. Department of Agriculture, Food and Nutrition Service. Its goal is to see if the redesigned WIC food packages meet the goals of the program, which are to protect the health of women, infants, and young children who are at risk of poor nutrition.